COPENHAGEN, Denmark, December 19, 2009 (ENS) – After a marathon all night session at the UN climate summit in Copenhagen, talks aimed at reaching a deal to limit greenhouse gases warming the planet ended with what UN Secretary-General Ban Ki-moon called an “essential beginning” that contains progress on all key fronts. Early this morning, delegates representing 194 countries agreed to “take note” of the Copenhagen Accord – the result of two weeks of talks and two years of negotiations. The document, drawn up Friday by leaders from the United States, China, India, Brazil and South Africa, is not legally binding and it was not voted upon or signed, but simply noted. Ban’s assistant later explained that the words “take note of” and “accept” are nearly equal in legal terms. 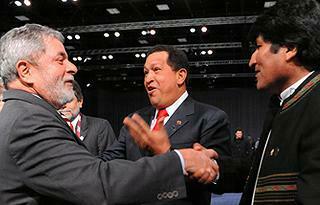 The Copenhagen climate change conference was scheduled to end on Friday, but talks continued until today because of the disagreement of several developing countries, including Bolivia, Cuba, Sudan, Tuvalu and Venezuela. These countries said they could not accept the Copenhagen Accord draft because it lacked ambitious targets for reducing carbon emissions. After persuading the parties to “take note of the Copenhagen Accord,” Ban urged them to translate it into a legally binding treaty as soon as possible in 2010. Under the Copenhagen Accord, developed countries, including the United States, will outline a range of emission reductions targets up to 2020 by February 1, 2010. This will be the first time the United States has committed itself to a formal emissions reduction target. Both commitments and intentions in terms of greenhouse gas reductions will be subject to international monitoring and verification. Countries accepted to work towards limiting the rise in global temperatures to below two degree Celsius above pre-industrial levels. But there was no agreement on a long-term target of a 50 percent cut in global greenhouse gas emissions by 2050 to avert dangerous climate change, and no agreement that global emissions should peak by 2015-2020. Both of these conditions are, according to the Intergovernmental Panel on Climate Change, necessary to achieve stabilization of greenhouse gas concentrations at 450 parts per million and to avoid global temperature rises of more than two degrees Celsius above pre-industrial levels. The Copenhagen Accord does outline support for technology transfer and capacity building for developing economies while putting forward a financial package aimed at assisting developing ones adapt to climate change and to begin de-carbonizing their economies. The Copenhagen Accord recognized the crucial role of forests in addressing climate change saying their was a need to recognize reduced emissions from deforestation and forest degradation plus conservation (REDD+) through the immediate establishment of a mechanism to enable the mobilization of financial resources from developed countries. Ban said results were achieved on all four of the benchmarks for success that he set forth during the special leaders’ summit on climate change held at UN Headquarters in New York in September. “All countries have agreed to work towards a common long-term goal to limit the global temperature rise to below two degrees Celsius; many governments have made important commitments to reduce or limit emissions; countries have achieved significant progress on preserving forests; and countries have agreed to provide comprehensive support to the most vulnerable to cope with climate change,” Ban said, enumerating the four benchmarks. “This was perhaps not the big breakthrough some had hoped for, but neither was it a breakdown which at times seemed a possibility,” said Achim Steiner, UN under-secretary general and executive director of the UN Environment Programme. “I would have liked more. This will not solve the threat of climate change. 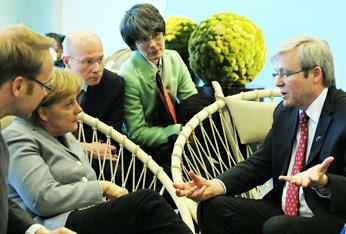 But it is a first step, an important step,” said Swedish Prime Minister Fredrik Reinfeldt in Copenhagen. French President Nicolas Sarkozy said that all nations had signed up to a plan to provide developing nations with up to $100 billion per year in climate change-related aid by 2020 and that follow up meetings to Copenhagen would be held in the German city of Bonn in six months. “This progress did not come easily and we know that progress on this particular aspect of climate change negotiations is not enough,” the President said, emphasizing it is “necessary ultimately to get” a legally binding agreement. In Copenhagen on Friday, Obama said, the most important result of the summit is that large emerging economies began “for the first time” to open up to taking on responsibility for limiting growth of greenhouse gas emissions. “If you look at a country like India, they still have hundreds of millions of people that don’t even have electricity, hundreds of millions that live in dire poverty. For them to, even voluntarily, say that they will be willing to reduce their carbon intensity by a given percentage is a huge step. 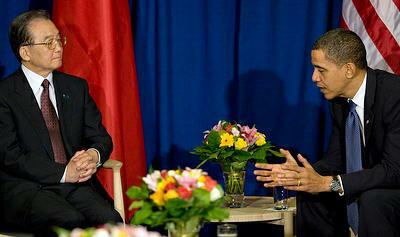 We applaud them for that,” Obama told journalists. “As responsible citizens of the globe, we have agreed to take on a voluntary target of reducing the emission intensity of our GDP growth by around 20 percent by 2020 in comparison to 2005,” said Singh. 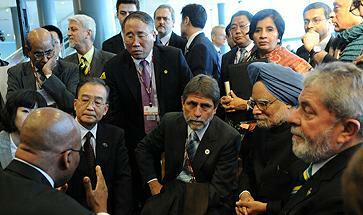 It is this type of commitment that will be inscribed in the Annex to the Copenhagen Accord by February 1, 2010. 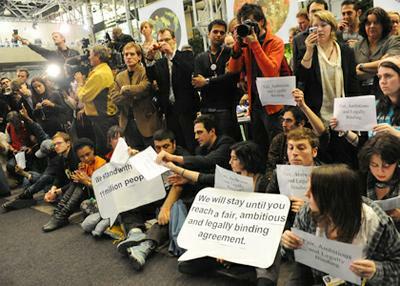 Citizens groups reacted to the Copenhagen Accord from a wide variety of viewpoints. “IUCN urges all countries to build on the Copenhagen Agreement and to find the common ground necessary to deliver an equitable, comprehensive and legally binding agreement by the end of 2010,” said IUCN Director General Julia Marton-Lefevre. The Accord will not only be disastrous for the climate, it will freeze the inequity in the world for perpetuity,” said CSE Director Sunita Narain. “This will be disastrous for the climate, and for India’s most vulnerable communities,” said Narain. “This is a wing and a prayer deal. While it does commit to keep warming below 2 degrees, it leaves all the hard decisions on how to get there to the fate of ongoing negotiations next year,” said Don Henry, executive director of the Australian Conservation Foundation. “This is a important moment. Much more is needed, but today marks a foundation for a global effort to fight climate change,” said Jonathan Lash, President of the World Resources Institute, a Washington, DC-based think-tank. “Victory was snatched from the jaws of defeat. As a small group of countries threatened to block the deal, the vast majority of countries elected to go ahead without them,” said Lash. “The Copenhagen climate summit has ended and no, we do not have the fair, ambitious and legally binding agreement that millions around the world hoped that the more than 120 world leaders gathered here would deliver,” the organization said in a statement on its website and posted on Greenpeace, WWF, Oxfam, Amnesty, Avaaz, and 350.org sites. “Despite overwhelming scientific evidence and massive popular support from citizens in countries North and South, world leaders chose national political self-interest over the fate of future generations and failed to resolve the issues blocking the road towards a just outcome. While this deal cannot be judged as a success, it is impossible to be without hope,” the coalition statement says. 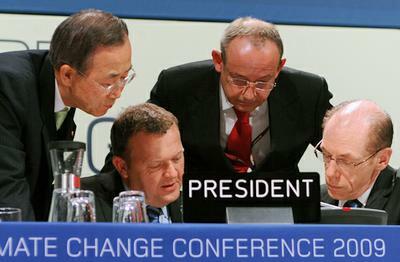 The next annual United Nations climate conference will be held in December 2010 in Mexico City. 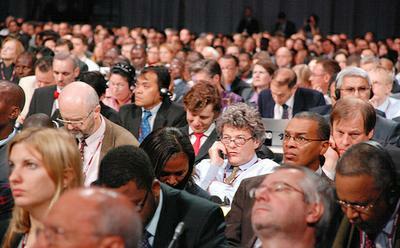 South Africa has offered to host the following UN climate conference in December 2011.